VM の作成には数分かかります。The VM takes a few minutes to create. VM の作成が完了するまで、残りの手順を続行しないでください。Don't continue with remaining steps until the VM has finished creating. ポータルで、VM が作成される際に、myVm nsg という名前のネットワーク セキュリティ グループも作成され、それが VM のネットワーク インターフェイスに関連付けられます。While the portal creates the VM, it also creates a network security group with the name myVm-nsg, and associates it to the network interface for the VM. 米国東部リージョンで既に Network Watcher を有効にしている場合は、「Insights プロバイダーの登録」に進んでください。If you already have a network watcher enabled in the East US region, skip to Register Insights provider. ポータルの左上隅の [すべてのサービス] を選択します。In the top, left corner of portal, select All services. [フィルター] ボックスに「Subscriptions」と入力します。In the Filter box, type Subscriptions. 検索結果に [Subscriptions] が表示されたら、それを選択します。When Subscriptions appear in the search results, select it. サブスクリプションの一覧から、プロバイダーを有効にするサブスクリプションを選択します。From the list of subscriptions, select the subscription you want to enable the provider for. [設定] で、[リソース プロバイダー] を選択します。Select Resource providers, under SETTINGS. 次の図に示すように、microsoft.insights プロバイダーの [状態] が [登録済み] であることを確認します。Confirm that the STATUS for the microsoft.insights provider is Registered, as shown in the picture that follows. 状態が [未登録] である場合、プロバイダーの右側の [登録] を選択します。If the status is Unregistered, then select Register, to the right of the provider. 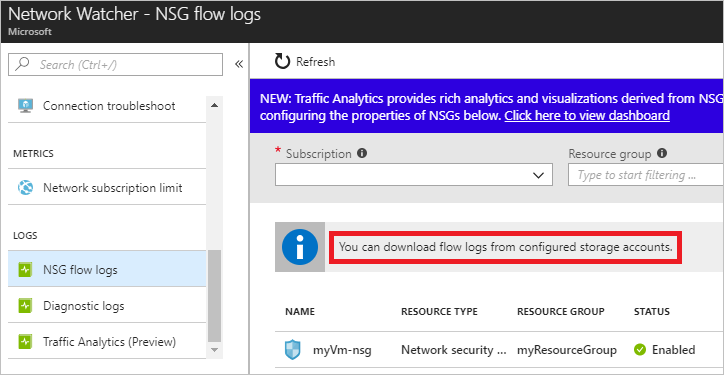 NSG フロー ログ データは Azure Storage アカウントに書き込まれます。NSG flow log data is written to an Azure Storage account. 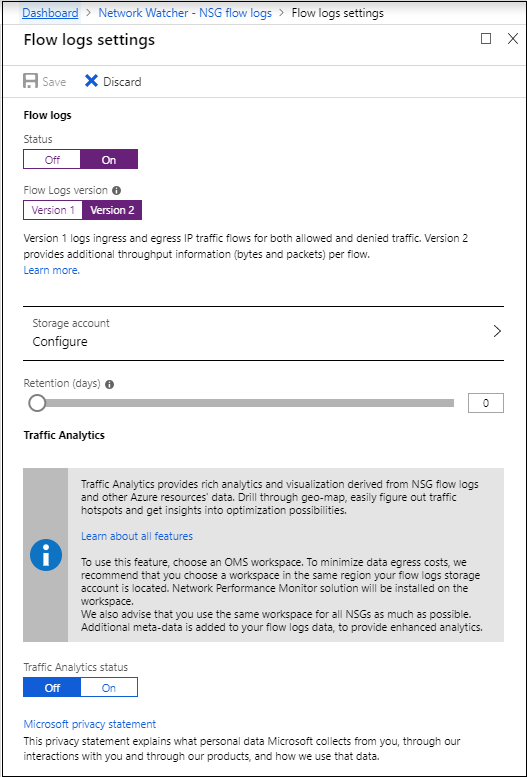 Azure Storage アカウントを作成するには、ポータルの左上隅の [+ リソースの作成] を選択します。To create an Azure Storage account, select + Create a resource at the top, left corner of the portal. [ストレージ]、[ストレージ アカウント - Blob、File、Table、Queue] の順に選択します。Select Storage, then select Storage account - blob, file, table, queue. 次の情報を入力するか選択し、それ以外の情報は既定値をそのまま使用して、[作成] を選択します。Enter, or select the following information, accept the remaining defaults, and then select Create. NameName 3 ～ 24 文字の長さで、小文字の英数字のみを含めることができ、すべての Azure Storage アカウントで一意である必要があります。3-24 characters in length, can only contain lowercase letters and numbers, and must be unique across all Azure Storage accounts. ストレージ アカウントの作成には、しばらくかかる場合があります。The storage account may take around minute to create. ストレージ アカウントが作成されるまで、残りの手順を続行しないでください。Don't continue with remaining steps until the storage account is created. ストレージ アカウントを作成せずに、既存のものを使う場合は、ストレージ アカウントの [設定] の [ファイアウォールと仮想ネットワーク] で [すべてのネットワーク] (既定値) が選択されているストレージ アカウントを選択してください。If you use an existing storage account instead of creating one, ensure you select a storage account that has All networks (default) selected for Firewalls and virtual networks, under the SETTINGS for the storage account. ポータルの左上隅の [すべてのサービス] を選択します。In the top, left corner of portal, select All services. [フィルター] ボックスに「Network Watcher」と入力します。In the Filter box, type Network Watcher. 検索結果に [Network Watcher] が表示されたら、それを選択します。When Network Watcher appears in the search results, select it. NSG の一覧から myVm-nsg という名前の NSG を選択します。From the list of NSGs, select the NSG named myVm-nsg. [フローのログ設定] の下で [オン] を選択します。Under Flow logs settings, select On. 手順 3 で作成したストレージ アカウントを選択します。Select the storage account that you created in step 3. [リテンション期間 (日数)] を 5 に設定し、[保存] を選択します。Set Retention (days) to 5, and then select Save. ポータルの Network Watcher から、[ログ] の下の [NSG フロー ログ] を選択します。From Network Watcher, in the portal, select NSG flow logs under LOGS. 「NSG フロー ログの有効化」の手順 2 で構成したストレージ アカウントを選択します。Select the storage account that you configured in step 2 of Enable NSG flow log. [Blob service] で [BLOB] を選択し、[insights-logs-networksecuritygroupflowevent] コンテナーを選択します。Under Blob service, select Blobs, and then select the insights-logs-networksecuritygroupflowevent container. PT1H.json ファイルの右側の [...] を選択し、[ダウンロード] を選択します。Select ... to the right of the PT1H.json file and select Download. 15421103771542110377 タイム スタンプTime stamp UNIX EPOCH 形式でフローが発生した際のタイム スタンプ。The time stamp of when the flow occurred, in UNIX EPOCH format. 前の例では、日付は 2018 年 5 月 1 日午後 2:59:05 GMT に変換されます。In the previous example, the date converts to May 1, 2018 at 2:59:05 PM GMT. 10.0.0.410.0.0.4 送信元 IP アドレスSource IP address フローが発生したソース IP アドレス。The source IP address that the flow originated from. 10.0.0.4 は、「VM の作成」で作成した VM のプライベート IP アドレスです。10.0.0.4 is the private IP address of the VM you created in Create a VM. 13.67.143.11813.67.143.118 宛先 IP アドレスDestination IP address フローが送信された宛先 IP アドレス。The destination IP address that the flow was destined to. 4493144931 発信元ポートSource port フローが発生したソース ポート。The source port that the flow originated from. 443443 宛先ポートDestination port フローが送信された宛先ポート。The destination port that the flow was destined to. トラフィックの送信先はポート 443 であったため、ログ ファイルの UserRule_default-allow-rdp という規則によって、フローが処理されました。Since the traffic was destined to port 443, the rule named UserRule_default-allow-rdp, in the log file processed the flow. TT ProtocolProtocol フローのプロトコルが TCP (T) かまたは UDP (U) か。Whether the protocol of the flow was TCP (T) or UDP (U). OO 方向Direction トラフィックが受信 (I) かまたは送信 (O) か。Whether the traffic was inbound (I) or outbound (O). AA ActionAction トラフィックが許可された (A) かまたは拒否された (D) か。Whether the traffic was allowed (A) or denied (D). CC フロー状態 (バージョン 2 のみ)Flow State Version 2 Only フローの状態をキャプチャします。Captures the state of the flow. 次の状態があります。B: 開始。フローが作成された時点です。Possible states are B: Begin, when a flow is created. 統計は提供されません。Statistics aren't provided. C: 継続中。フローが進行中です。C: Continuing for an ongoing flow. 5 分間隔で統計が提供されます。Statistics are provided at 5-minute intervals. E:終了。フローが終了した時点です。E: End, when a flow is terminated. 統計が提供されます。Statistics are provided. 3030 送信済みパケット数 - 送信元から宛先 (バージョン 2 のみ)Packets sent - Source to destination Version 2 Only 最後の更新以降に送信元から宛先に送信された TCP または UDP パケットの総数。The total number of TCP or UDP packets sent from source to destination since last update. 1697816978 送信済みバイト数 - 送信元から宛先 (バージョン 2 のみ)Bytes sent - Source to destination Version 2 Only 最後の更新以降に送信元から宛先に送信された TCP または UDP パケットのバイト数の合計。The total number of TCP or UDP packet bytes sent from source to destination since last update. パケットのバイト数には、パケット ヘッダーとペイロードが含まれます。Packet bytes include the packet header and payload. 2424 送信済みパケット数 - 宛先から送信元 (バージョン 2 のみ)Packets sent - Destination to source Version 2 Only 最後の更新以降に宛先から送信元に送信された TCP または UDP パケットの総数。The total number of TCP or UDP packets sent from destination to source since last update. 1400814008 送信済みバイト数 - 宛先から送信元 (バージョン 2 のみ)Bytes sent - Destination to source Version 2 Only 最後の更新以降に宛先から送信元に送信された TCP および UDP パケットのバイト数の合計。The total number of TCP and UDP packet bytes sent from destination to source since last update. パケットのバイト数には、パケット ヘッダーとペイロードが含まれます。Packet bytes include packet header and payload. このチュートリアルでは、NSG の NSG フローのログ記録を有効にする方法について説明しました。In this tutorial, you learned how to enable NSG flow logging for an NSG. また、ファイルに記録されたデータをダウンロードし、表示する方法も説明しました。You also learned how to download and view data logged in a file. Json ファイル内の生データは解釈が難しい場合があります。The raw data in the json file can be difficult to interpret. データを視覚化するため、Network Watcher トラフィック分析、Microsoft PowerBI、およびその他のツールを使用できます。To visualize the data, you can use Network Watcher traffic analytics, Microsoft PowerBI, and other tools.